Contact us with your requirements and we can get you working with Easy-PC 22 today. If you would prefer to have a quick look before you buy, you can download the Easy-PC 22 trial version using this link. V22 provides you access to the Easy-PC Component Search Engine, brought to you in partnership with Samacsys, this service provides unlimited access to over 13 million components and symbols that can be interactively downloaded directly into your libraries and onto the end of your cursor, ready for placement in Easy-PC. 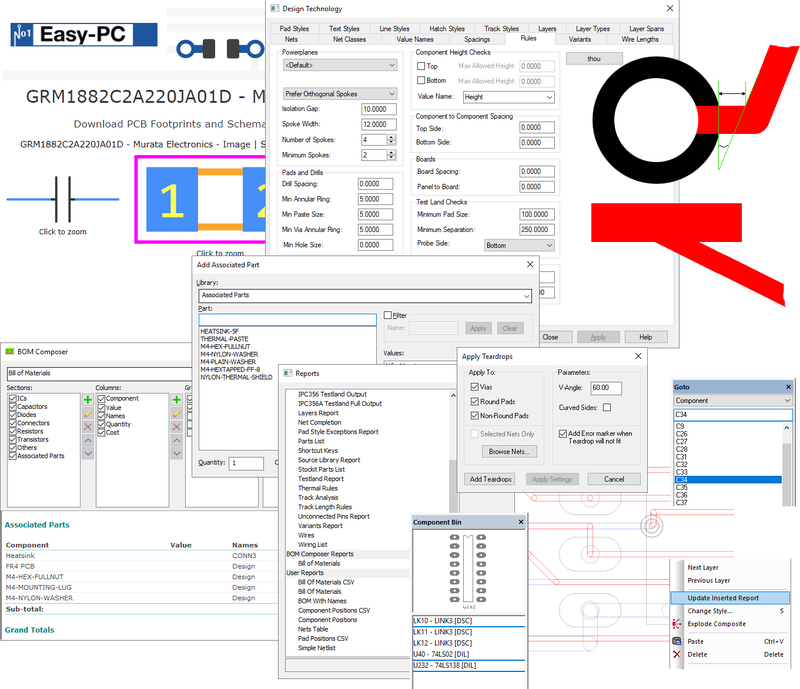 All manufacturer values such as Part Number and Price are added to the Component within Easy-PC upon download, further reducing the time taken to create components and ensuring they contain all relevant values needed for your Bill of Material (BOM). There is a new type of Library item introduced for version 22 called an Associated Part. 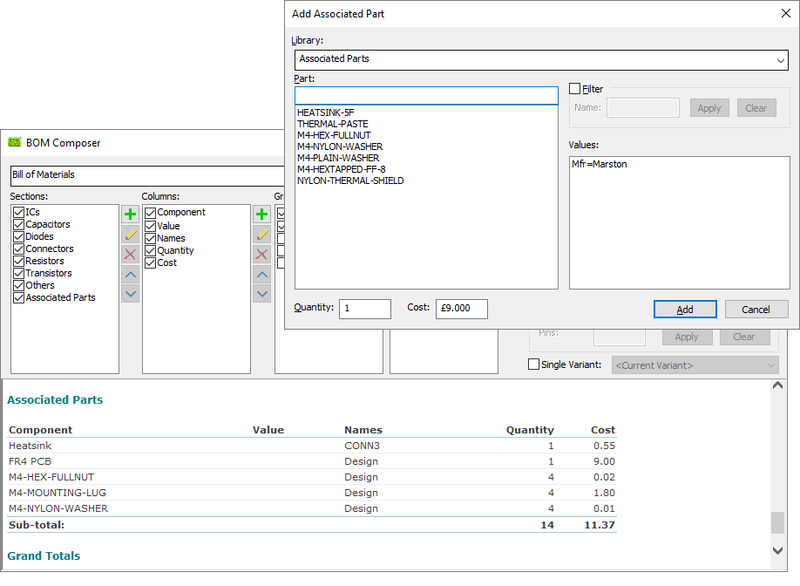 This is used when a component requires additional items to be provided on the Bill Of Materials (BOM) but where you do not wish them to physically appear in the design, e.g. a TO-220 transistor would include the Heatsink, Bolt, Nylon Washer and Thermal Paste where as a design may have the PCB and Mounting Lugs added as an associated part. Associated Parts can be added to both the Design and also the Component level, providing you flexibility and accuracy in your BOM report. The ability to specify Reports when generating a 'set' of plots has been added to the Plotting and Printing dialog. 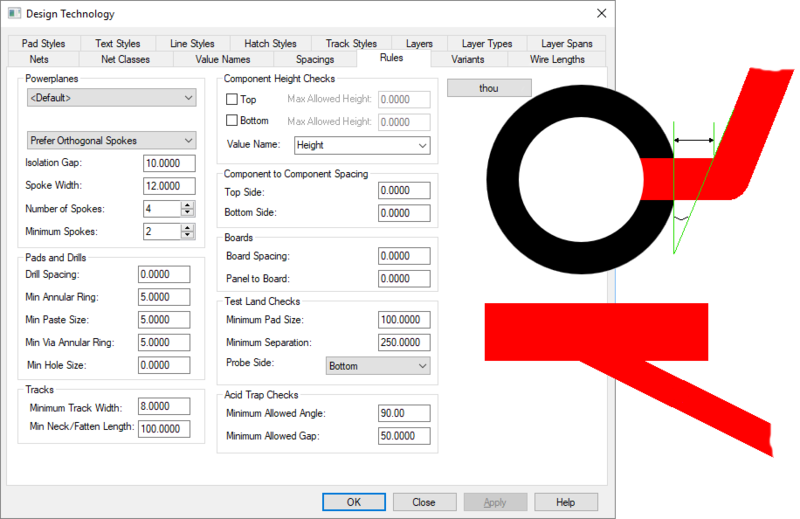 This allows you to include reports such as a Bill of Materials, Layers Report and a Design Rule Check report automatically at the Plotting stage. 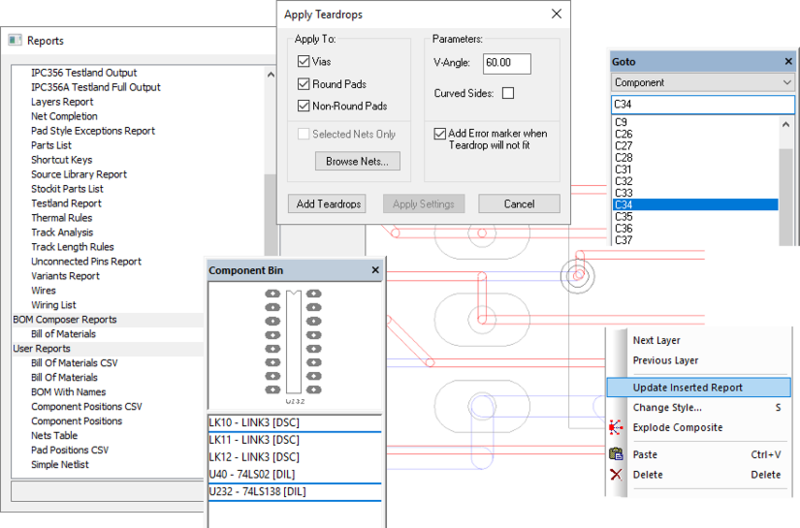 DXF and IDF outputs can now be included as part of your Plotting process, enabling you to produce a complete set of outputs in one easy to use dialog. 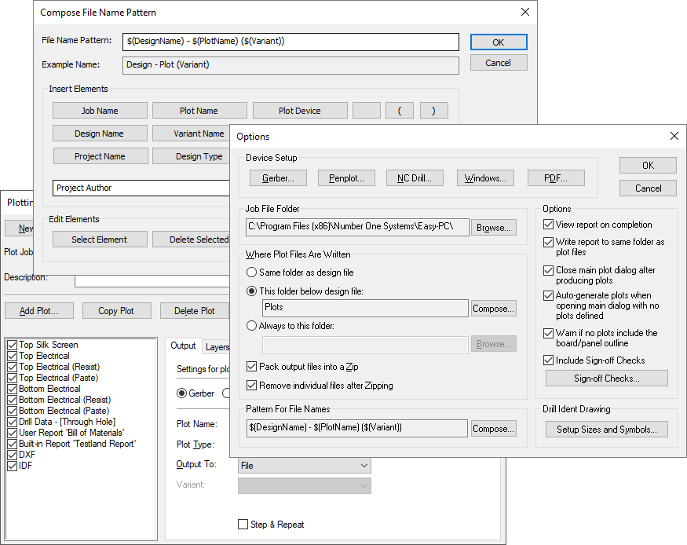 Version 22 introduces user-defined formatting of Folder and File names in the Options dialog of Plotting and Printing. This uses a 'tag' scheme with user-defined key words to format the output filename. This applies to the folder name when the folder is set to 'this folder below design', and to file names for each plot. Tags can include Design Name, Plot, Plot Job and Project Name, Device Type, etc. To help you construct the tag pattern, syntax and creation, there is a new Compose dialog. Using Version 22, you can now choose to save all the output files directly into a Zip folder. A new Rule and Check for Acid Traps in the Design. Acid Traps: This checks for acid traps between Track segments and between Tracks and Pads within the design that infringe the rules defined. Checks for track segments which end on a via that does not appear to be connected to a Pour Area or plane. This aids the verification of the overall signal integrity to ensure no 'gaps' appear in the electrical path. A new rules and check for Test Lands are available for minimum separation, minimum land size, under components and unreachable side. Pro-Library 8 Update The Pro-Library has over just over 121,000 associated Symbols and Footprints. Micro Library 8 Update Over 14,300 Micro-controller components. If you have a previous version of any library you may be eligible for special promotional prices. Click here for all the existing customer updates. Click Here for more information on the Library pricing without a previous version. Click here for all the existing customer updates. 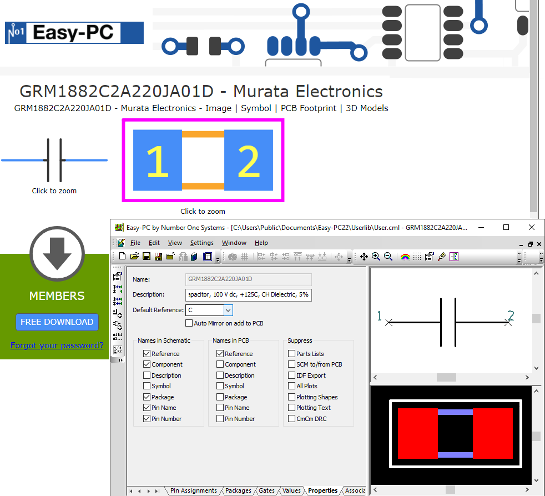 Easy-PC is a complete schematic capture and printed circuit board electronic CAD software solution. .. The latest Easy-PC users guide comes free with initial orders or full purchases of Easy-PC 1000,2000.. Most products except the Pro Router can be downloaded and you can save the downloaded file for fut..